Decorating a small living space can be a little trickier than decorating large living spaces. You want to make the most of the space that you have and ensure you’re enhancing the room to its full potential. Here, you’ll find numerous tricks and little snippets of inspiration that will allow you to make the most of your very own small living space. Take a look and see what you can do with your small living space! Firstly, it can be a good idea if you start paying attention to your vertical space and aim to make the most of it. Your vertical space can be an opportunity for you to free up your floor space, which is ideal for small living spaces. You can use shelving and cabinets to do this, as well as other kinds of wall storage. For instance, if you don’t have much room in the bathroom, shower caddies and large wall cabinets can be a blessing! Mirrors are an essential part of daily living, but they can also be used strategically to make a small space look bigger. They won’t actually add any space, of course, but they can make a room look much more substantial and even more luxurious when you select the right style. Placing your mirrors strategically will reflect light and space and add a great decor element. Finding furniture that doubles up is another smart idea if you’re short on space. You can buy ottoman boxes, beds that have storage underneath, and all kinds of other furniture that you can use to store things in! Painting the ceiling might seem strange, but it can be a great idea if you’re trying to draw the eye upwards. Providing you’ve painted a room a light colour, you could extend this colour onto the ceiling and marvel at how much larger it makes the room seem. 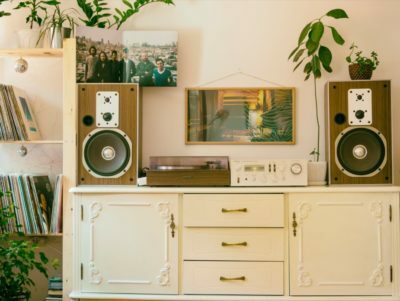 If you’re thinking about looking for a condo for sale or downsizing your home, researching more tricks like this will enable you to get the most out of your space as soon as you move in. Neutral colours are often the best choice for a small living space, however, pastels and other light colours can work well too. Darker colours can be used, but you will need to be strategic with them so that they don’t make a small room look like a dingy cave. Find a neutral colour scheme that you like and include a pop of bright colour if you like. Sometimes, you can even have white walls and use your accessories to add colours and patterns that you like! Patterns can be used strategically to make a small living space look larger. Stripes are amazing and can be used on the walls to further draw the eye upward. They can also be used on curtains. Then, you have the option to use artwork (which all homes should have) to draw the eye up. A large piece right above your sofa can work wonders and make your living room appear much bigger. Using low slung furniture is fantastic in a small space, as it can make a room feel grander! You don’t need to pick small furniture pieces to go in your small space, as sometimes that can make a room look even more cramped. You might actually be better off choosing pieces that fill the space properly. Feel free to mix different furniture styles for a fun effect – matching everything is no longer the best idea. It can look boring and tends to be a little lazy! Having the right window dressings is a good idea if you have a small living space. Long, thick curtains can make a room cosier, but they can also take away some space. Blinds or shorter more sheer curtains can be better if you want to emphasize your space. You’ll also be able to let in more natural light, which is key for a small living space. You’ll also find that you feel happier and more productive when you’re letting more natural light into your home! Decorating a small living space can be a little tricky, but it’s totally possible to make it look incredible if you use the tips and tricks here. Do you have any advice you’d like to share? Let us know! ← Can You Afford a Cultural Trip Working Remotely?